As you know, I had the pleasure of attending Cosmoprof North America this year to learn about some of my favorite nail brands and about some I had never heard of. The overall experience was wonderful, especially as a licensed nail tech and blogger. I'll be sharing some of my favorite experiences from the show with you here at Nailed It. You'll hear about some of the upcoming collections from your favorite brands, new products on the market, and improvements to the ways you work with your own nails, so look for the CPNA2014 tag. The first is a well-known brand I'm sure you all know - Zoya. I didn't have an appointment to visit with the booth, so my visit was brief but beneficial! 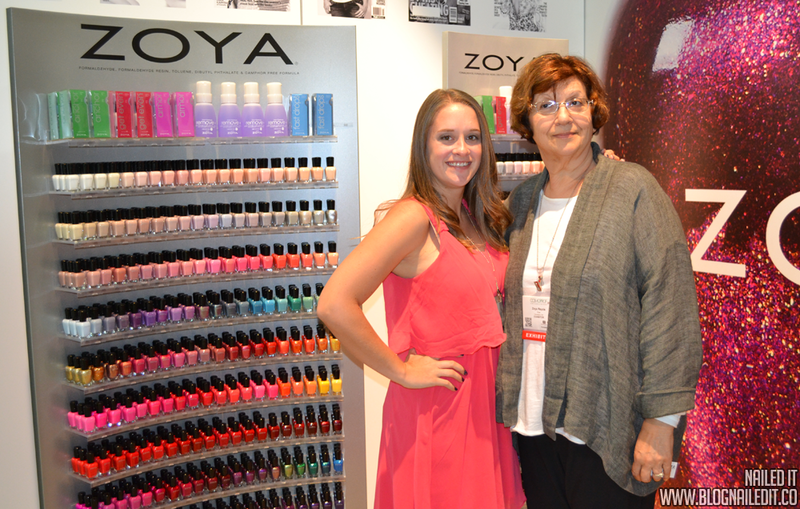 First and foremost, I was able to meet and have a quick Q&A session with Zoya Reyzis...the Zoya! As I didn't have an appointment, I felt bad eating up too much of her time, so I kept my questions focused on her, rather than upcoming collections or the company as a whole. One thing I was dying to find out was what her favorite Zoya shade was. She told me that her favorite pedicure polishes right now are the Pixie shades, but for her manicures, pure reds (like Diana and Carmen) have a special place in her heart. Pure reds signify warmness, richness, and to her, importance. She believes in the psychology of colors, and how they can really resonate with people. For Zoya, a pure red reminds her of home. It reminds her of her mom's velvet curtains when she was a young girl. She reminisced about playing under her mother's dining room table, where a warm red fringe tablecloth dangled off the edges. These memories signify warmth, signify being safe and cozy. I loved being able to share that small piece of her history, and was also pleased to take a picture with her. Besides the picture of us above, I don't have many pictures to share with you from the visit because of the upcoming products I got a sneak peek at, a few aren't ready to be shared with the public. You'll see them soon though! One collection has been released and is available now - Zoya Naturel Deux (2). This collection is being advertised as a "transitional" collection, meaning it's a late Summer/early Fall collection that's not a full-fledged release. The collection consists of 6 creme neutral shades - 3 plum and 3 brown shades. The transitional collection follows a previous release of Naturel (1). Zoya designers wanted to expand the original family of Naturel shades to fit even more skin tones, so Naturel Deux (2) is warmer. I was personally quite struck with this group of colors, and thought they'd work amazingly as a background to a floral pattern inspired by Lacquerstyle's tutorial. 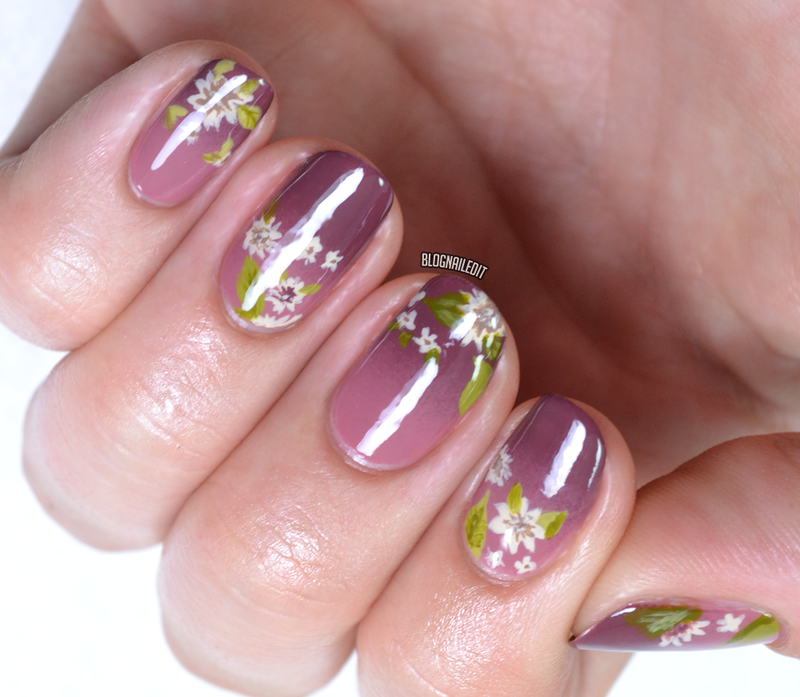 I did a gradient base of two of the plum shades, and also used them for some of the inner portions of the freehanded flowers. I got big compliments on this one! First I'll share the plum colors with you, then the brown. Madeline (2 coats) - This is the lightest plum of the 6 colors. It's a warm dusty mauve. Aubrey (2 coats) - The second lightest is Aubrey, which is really similar to the next color, but it's a little more pink and just a hair lighter. Marney (2 coats) - This is darkest plum shade. It actually leans slightly brown, so it's a good transition into the brown colors of Naturel Deux. Spencer (2 coats) - Though my skin looks weird, it's just because I was trying to adjust the tones in the picture to be more accurate. Spencer is just a great warm, dusty caramel color (a little darker than shown). Chanelle (2 coats) - This is a milkier shade, darker than Spencer. It's like the color of melted milk chocolate. Emilia (2 coats) - Finally there's Emilia, which is a fairly dark dusty brown. Noticeably darker than the other two browns. It's actually closer to Marney in color. If you liked my Cosmoprof update, I'll be posting more of other companies' updates with the blog tag "CPNA2014". That makes sense that she loves Diana and Carmen - they are some of the oldest shades in the company's catalog, and never get discontinued! Thanks for the info, and I have to say that was very thoughtful and classy of you to spend what time you had asking Zoya about herself rather than her products!